Nick flew in from the west coast and managed to navigate his way successfully to outer Birmingham on Thursday afternoon where Gill collected him and promptly forced him to walk in the damp woods with a couple of crazy hounds – so I was quite surprised when Nick was still awake when I got home from work. 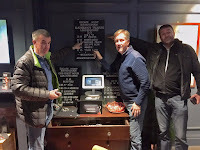 Actually, he was not just awake, he was actually buzzing – I’d left out some puzzles for him to solve – including a copy of Juno’s Spade Case (which he hadn’t seen yet) with a note of the Wi-Fi password safely stored inside. I knew he’d opened it as he’d already posted a pic on FaceBook with the evidence. 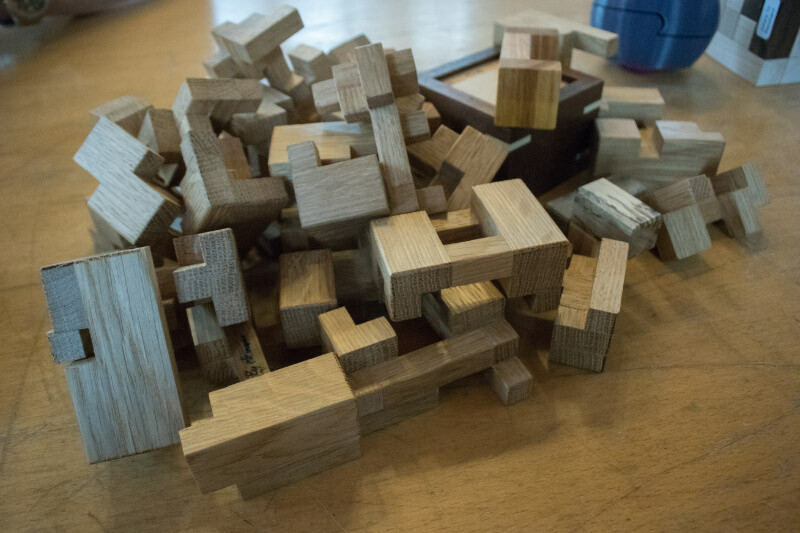 After dinner we fiddled around with a few puzzles and I amazed myself once or twice at being able to actually find a specific wooden puzzle hidden amongst a number of similar looking puzzles (Darrah’s New Kumiki Cube in case you were wondering). 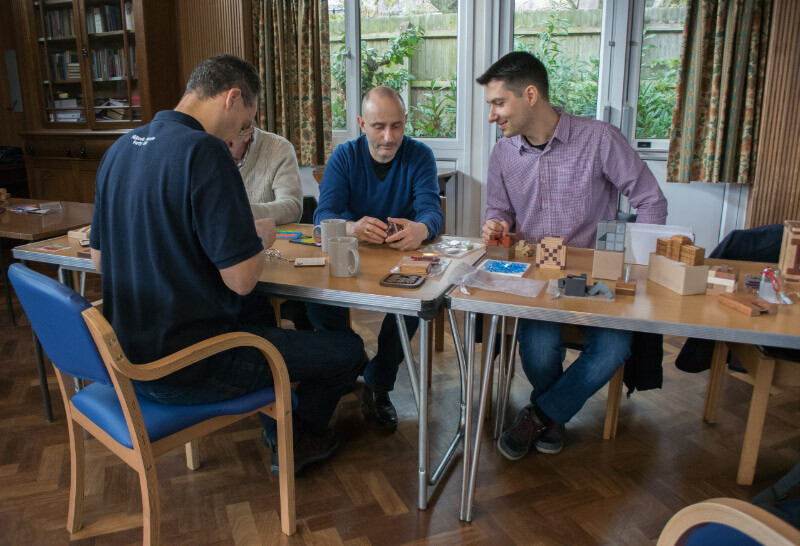 Nick presented me with a couple of gifts made by Tom Lensch – I could remember expressing an interest in Edi Nagata’s Plus puzzle, but somehow Nick had managed to not only intercept that request, but also took care of the payment. 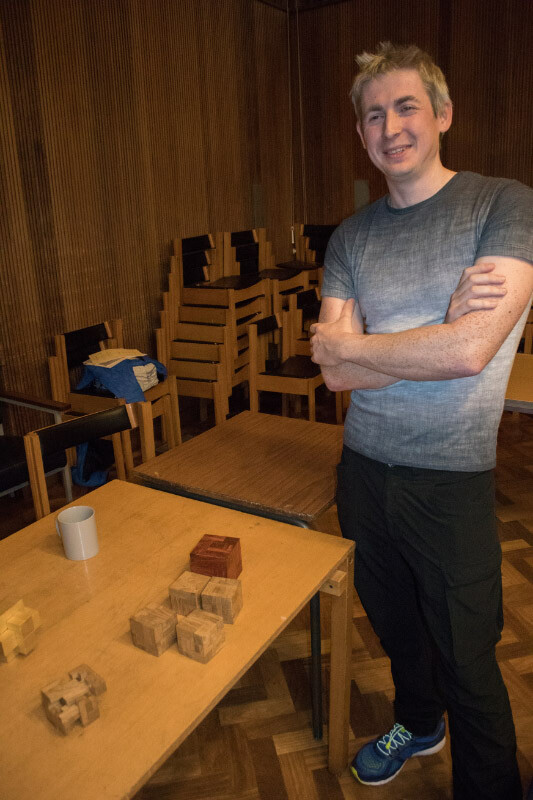 He also presented me with a copy of Osanori Yamamoto’s Long Box – whose solution duly eluded me the entire weekend, although I did manage to remember enough of the solution to Plus Puzzle to solve that one in a not unreasonable amount of time – for me. Thanks Nick! Nick bought us lunch at a wonderful Indian street food place called Mowgli before we grabbed a train back to Barnt Green for some more gentle puzzling. A round-trip to the airport collected Louis off his flight from Schiphol and by the time we got back, Ethel had joined the party – always lovely to see her! 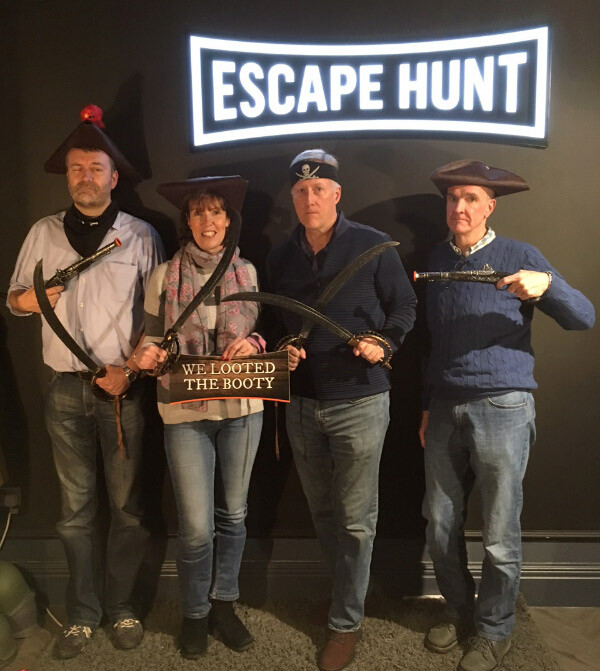 Gill rustled up a few excellent home-made pizzas for the evening’s sustenance and more banter and puzzling ensued… some of it rather late into the night – most of it without me as I retired somewhere around the witching hour. Louis had once again managed to bring along several gifts to add to my little collection, none of which I already had: a copy of Cast Hourglass that I managed to coax into a less Hourglass-y shape, but nowhere near being solved and a set of Vladimir’s latest: Triangle+, a fearsome (to me!) looking multi-stage symmetry puzzle and his Clogs puzzle – thanks Louis! 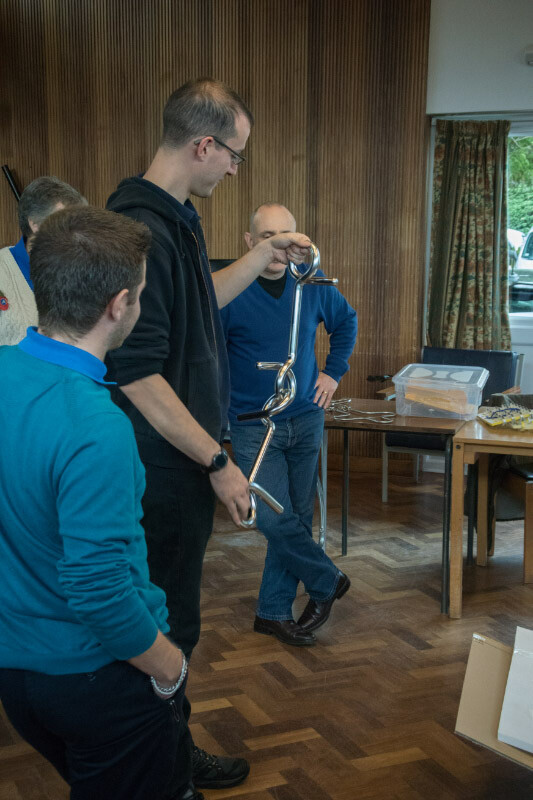 Next morning, we managed to get everyone out of bed and breakfasted on time, and headed down to the hall to get things set up… with random puzzlers drifting in while we were getting the tables in place. When I headed out to get the drinks and the milk for the day, I ran into Stefan who greeted me like a long-lost friend – it’s nice getting visitors from foreign climes coming back for more! About an hour later things had settled into their usual rhythm: Tim had set up a few tables-worth of vintage puzzles for sale; Ethel had a few crates-worth for folks to rummage through and haggle over; there was a gentle hum of background banter and there was plenty of heads-down puzzling going on. 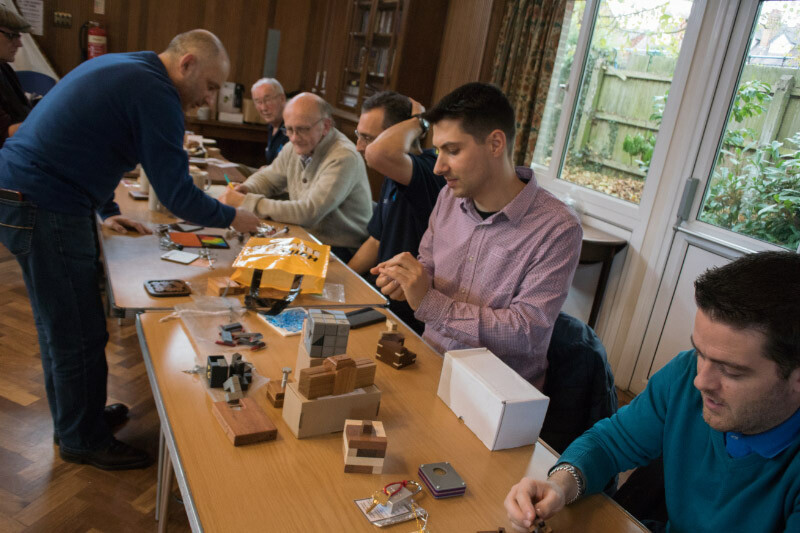 Kevin had brought along a handful of Happiness Cubes from Alfons, for Nick to have a look at and they quickly became the focus of several puzzlers’ rapt attention. These little guys are really intricate and we soon discovered that disassembly was no simple matter. At one point there must have been three or four of us sitting around trying to dismember a few of them and every now and then we’d pass our muddled mess on to someone else to try and make progress when it seemed we couldn’t find a way through… this, unfortunately resulted in some of the pieces getting mixed up in a pile in the centre of the table – this rather alarmed Kevin when he glanced over and spotted it – so we tried harder to keep things separate while we completed the dismembering. Sadly, we failed and we ended up with a large pile of pieces, which someone may have mixed up a little further, just to be sure. Kevin was not happy at this point – in spite of the large pile of Happiness on the table! We moved on to other puzzles because reassembly looked rather harder than assembly, especially now that the pieces had been somewhat jumbled. 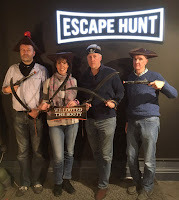 I’ll jump around a little in time for the sake of keeping the storyline together here, and mention that MPP’s awesomest Burrista, Rich, was in residence, and, taking pity on Kevin, we convinced Rich to have a bash at reassembling all that Happiness… AND HE DID! 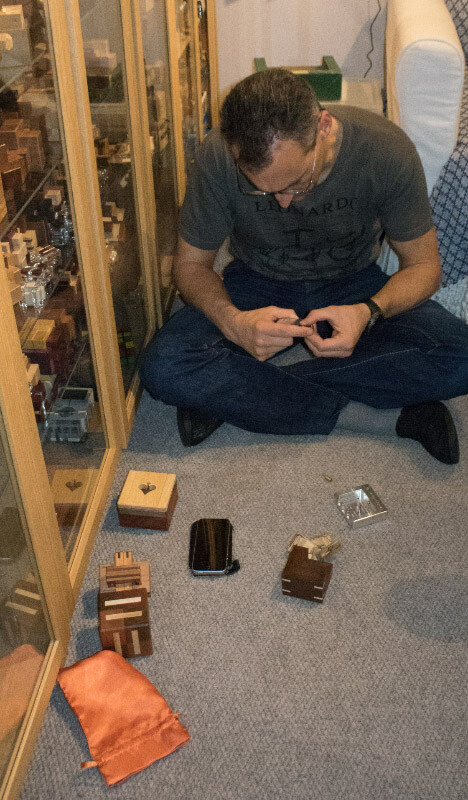 We were mightily impressed – having taken some of those darn things apart, we knew how complicated they were, so seeing him assemble them, in about the same time it took a team of us to dismantle them, was pretty impressive. Kevin breathed a large sigh of relief and returned to the puzzle he was playing with. Unfortunately (for Kevin), Rich decided he wanted the full experience of these wonderful puzzles, which obviously required him to experience disassembly as well, so he calmly and quietly reduced them to single large pile of pieces once more… which is how they stayed until Kevin was packing up – but just to prove we aren’t total bastards, we gave him a Tesco bag to take the pieces home in. OK, back to somewhere around the middle of the day and Big-Steve had brought in a rather large, heavy box of toys he’d recently imported from Japan. I’d been a little complicit in it and had an inkling of what was inside it – and I’d helped him lug it from his car into the hall – we left it in the middle of the hall for a couple of hours and tried to goad people into guessing how many puzzles were inside this huge heavy box – from Japan. Some suggested really silly answers, like “One” – it weighed north of 30 kilograms, after all. 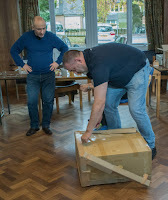 In the end we didn’t get any particularly sensible answers so Steve did a grand unboxing – or rather an aggressive attack on the rather sturdy packaging – well it would have to be, wouldn’t it? It weighed thirty kilograms! 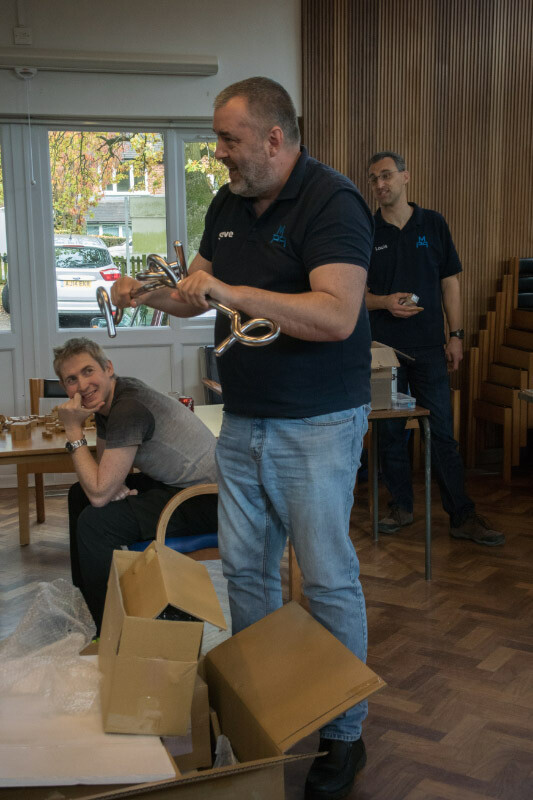 Having removed the outer layer of structurally supportive packaging, he went into the package and held aloft, carefully, a slightly more modest package representing one of the several puzzles we’d ordered… a simple little disentanglement puzzle – made in one-inch stainless steel bar – weighing in at 6 kilograms…. It is a monster! We’d ordered a few of those and a couple of somewhat smaller, but still massively supersized(! ), string entanglements – except it wasn’t string, it was full-on chains, around cast metal creations. Not dainty objects! Loud clanging from time to time signalled another puzzler having a bash at the simple puzzle – only to find that even though it’s just a standard simple design, trying to manipulate 6 kilos of puzzle to get things neatly aligned and moving in the right manner on a coordinated fashion, can be rather challenging. We called lunch somewhere around 1 o’clock and the gang formed an orderly queue at the local chippy (for those wanting the challenge of a man-sized kebab) and outside the deli (for those of us having pig rolls). Back at the hall there was plenty of happy munching and banter before the serious business of puzzling and banter was continued. 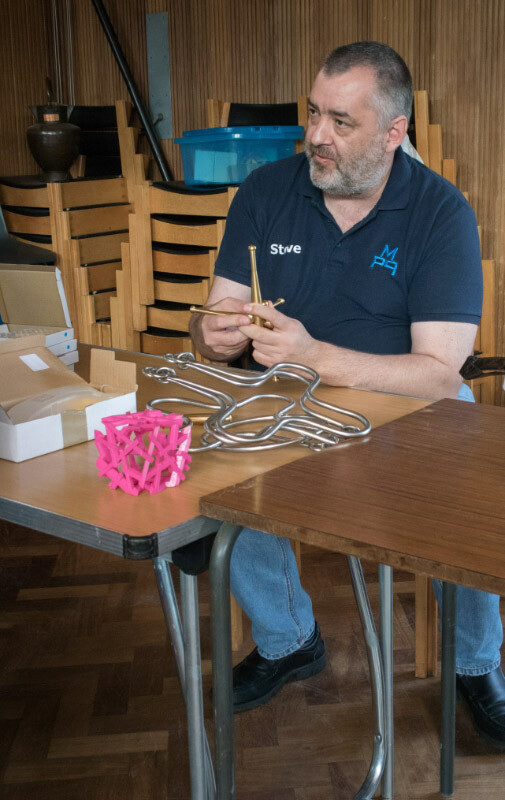 Steve had brought along a couple of printed kits of Derek’s latest put together – a cube made up of about 30 oddly-shaped pieces. 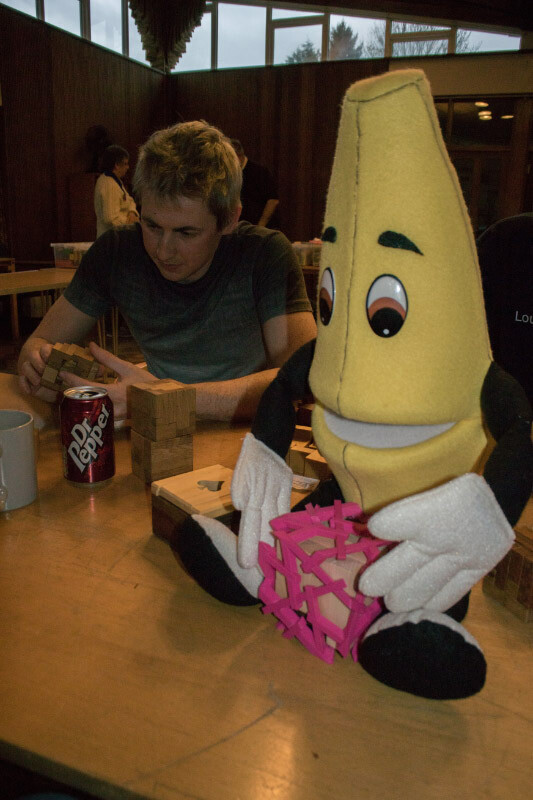 He’d given Kevin and I a set each and while we were working on all that Happiness, someone wondered if it might be possible to build the cube assembly around another puzzle. 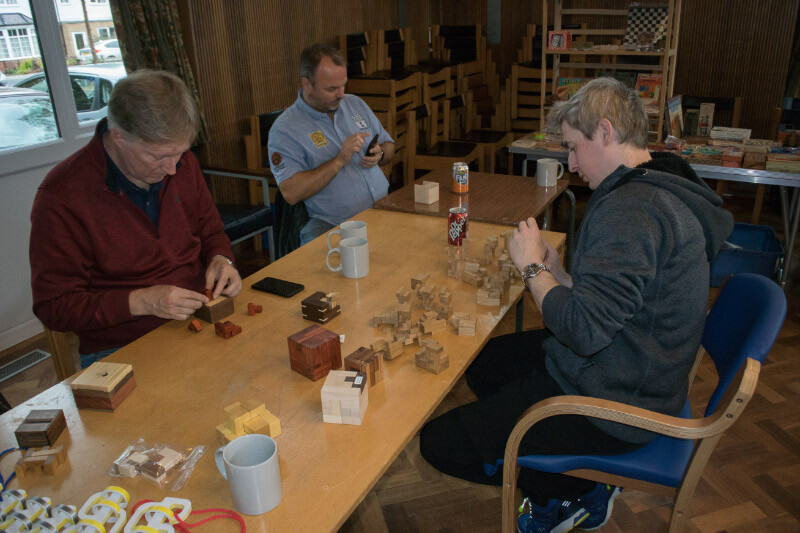 Without much hesitation we selected one of Kevin’s puzzles and set about encasing it, rather snugly as it turned out, in his very own copy of Derek’s new cube – we thought it looked brilliant… Kevin didn’t immediately agree. In fact, a week or so later he was still grumbling… he’ll get over it. I’m sure he will. Eventually. 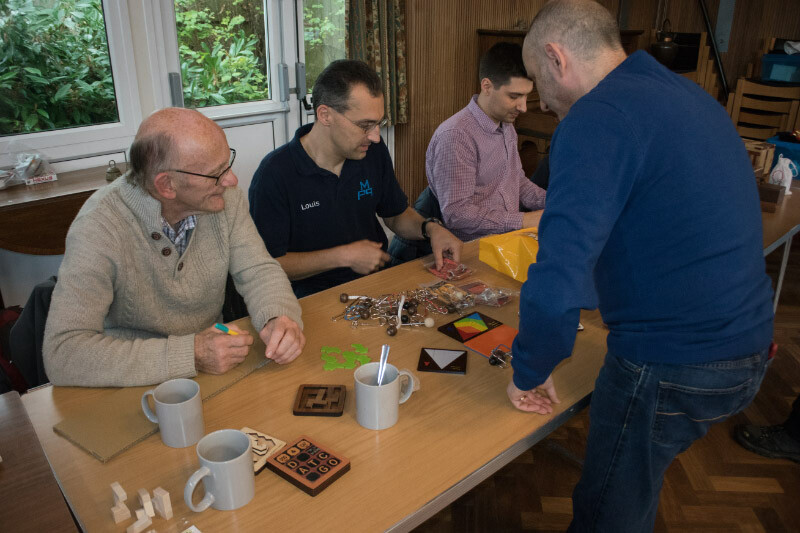 Several folks who hadn’t yet solved Jigsaw 29 were encouraged to have a go at solving it by those of us who’ve managed to beat it. 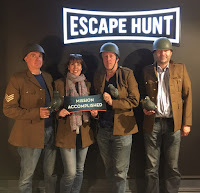 Most managed it, and thanked us for the “encouragement”. Juno’s Spade Case was also a big hit among the folks who hadn’t already purchased their own copy. My copy of Ton Delsing’s Cat & Dog (slightly restricted) sliding block puzzle had come out to play at some point on the Friday and it made its way to MPP on the Saturday – where several people tried, and failed, to make any progress on solving it – which made me feel slightly less stupid at not being able to solve it after about four years of trying. 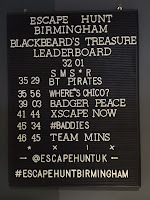 It seems that sliding block puzzles, and disentanglements are what I’m most rubbish at, followed shortly by any number of other genres you might care to name, come to think of it! 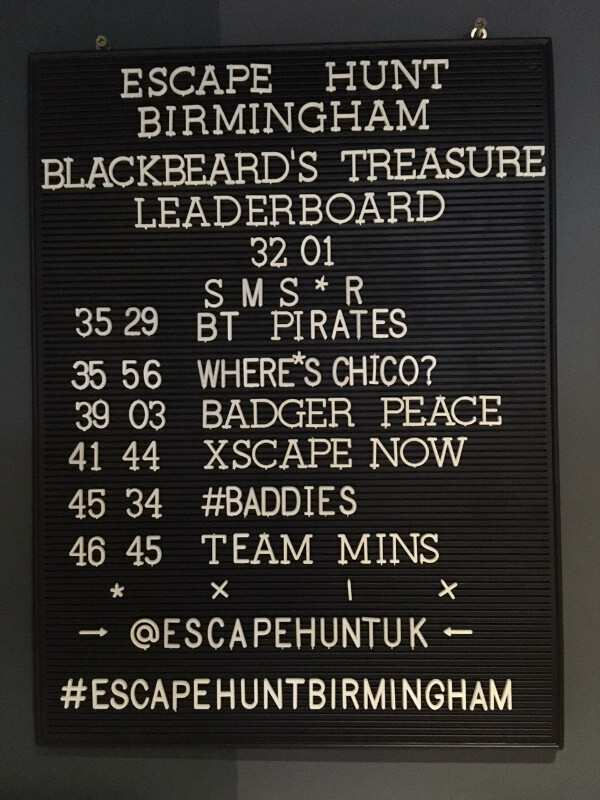 We packed up just before 6pm and headed back up the hill to Puzzling Times HQ for the traditional fish suppers and just a bit more puzzling. Despite ordering fewer and fewer portions of chips each time, we still seemed to have heaps of chips left over after everyone had had more than enough to eat. The puzzlers in the cave ended up in some serious puzzling, with Stefan motoring his way through a number of my more challenging sequential discovery puzzles – a task he continued the next morning when he came back for more. Sunday morning saw some even more leisurely puzzling after a grand spread for breakfast, before I dropped Nick and Stefan at the airport. Back in the puzzle cave, the two Dutch puzzlers and I set about doing a jigsaw on the floor – and it took us about an hour to finish the darn thing - one of the Nervous systems Geode range of puzzles – not a trivial challenge, and one helped by having three brains and three pairs of hands trying different alternatives in tandem. Shortly after finishing the jigsaw I dropped Louis and Rob at the airport for their flights to Schiphol and headed home to put the inevitable collection of puzzles left out half-solved away. Another cracker of an MPP weekend. 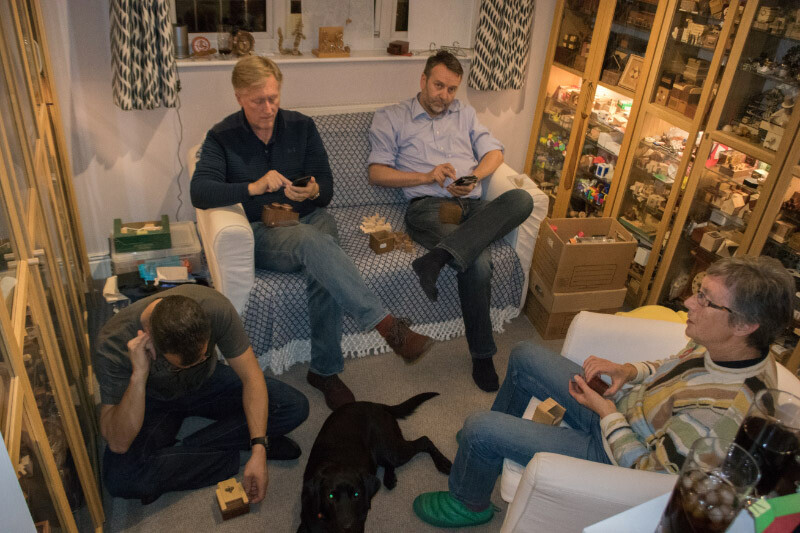 A couple of months ago I was given a rather stunning Kagen Sound Koa Bow Tie Box – actually, that’s not quite true – Kagen sort of threw it at my feet in front of my friends - or maybe dropped it might be more accurate, either way, he picked it up and gave it to me, and I was very chuffed! 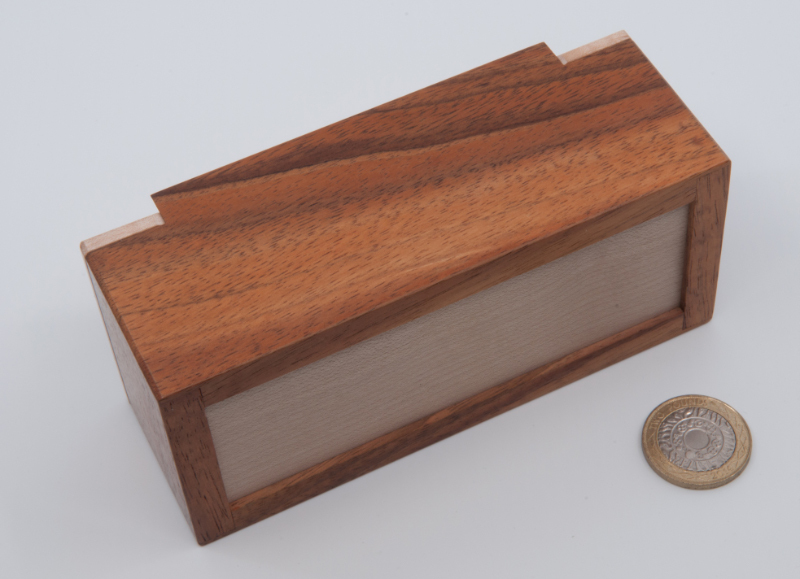 Developed in parallel with his larger runs of Circle Maze Boxes, this was a short run made as gifts so they look a little different, and possibly behave a little differently – but the latter is hard to confirm as they haven’t been released into the wild yet. 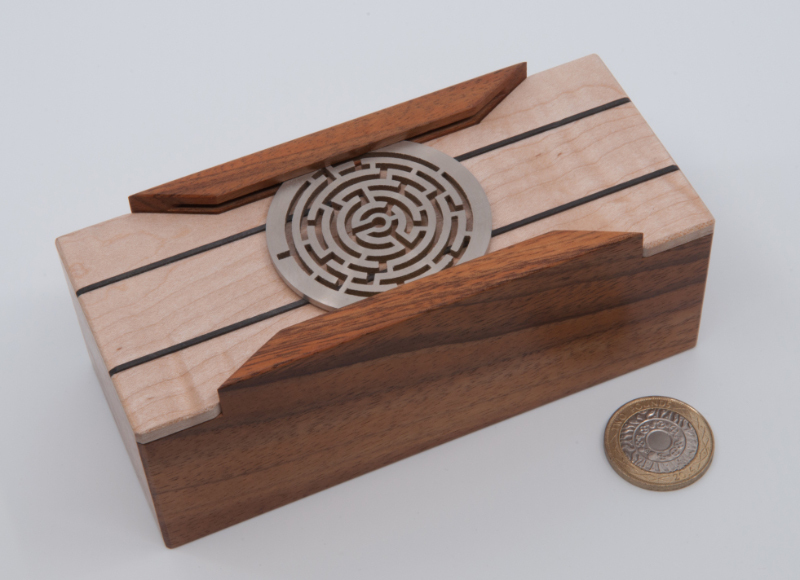 A little fiddling shows that the maze can move backwards and forwards along the lid (where that little peg allows) and it can also spin around… cool, so clearly all we’re going to need to do is to manoeuvre the maze around the peg until the lid of the box comes off. Turns out that it’s not quite that simple, though. 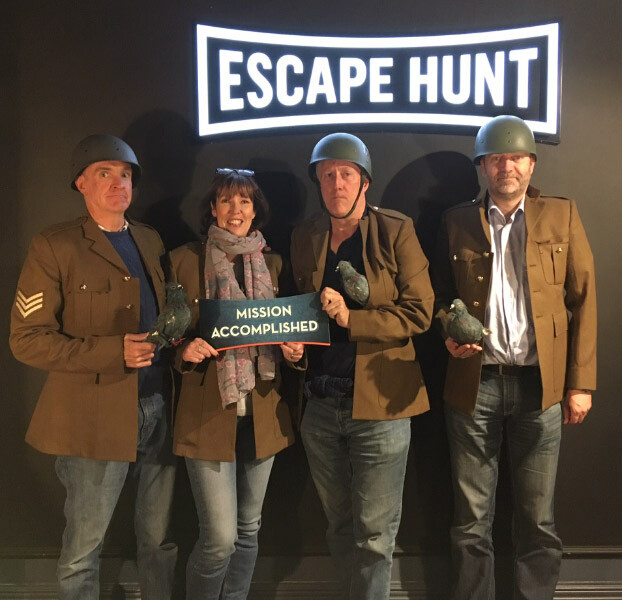 Quite quickly you might in fact find yourself running out of options in the maze – with no apparent way out… get past that one and you find yourself somewhere else in the maze – again, with no apparent way around things. 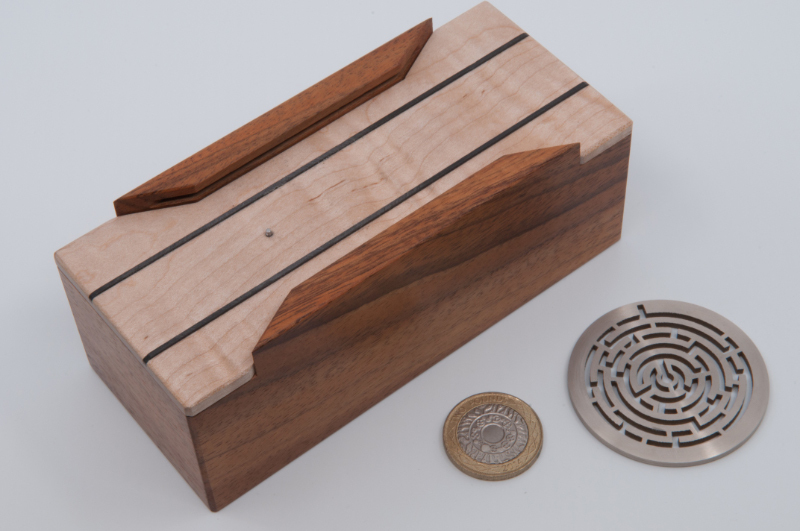 It’s not a horribly complex puzzle, but it’s an absolute delight to play with, and solve… and when you have, it’s hard not to admire the little details in there, from the book-matched grain all the way around the sides of the box, to the ebonised walnut peg and rails that keep the metal maze from scuffing the beautifully finished curly maple lid.